But since it’s my blog – I’m saying it’s ok.
Free for the first time in decades and hell-bent on making up for lost time, Ruth is headed straight for the town of Boggy Depot to feed on its inhabitants. The only one who can stop her is Judd Glenny, her grandfather and the one who made her in the first place… who’s regretted it every night since. 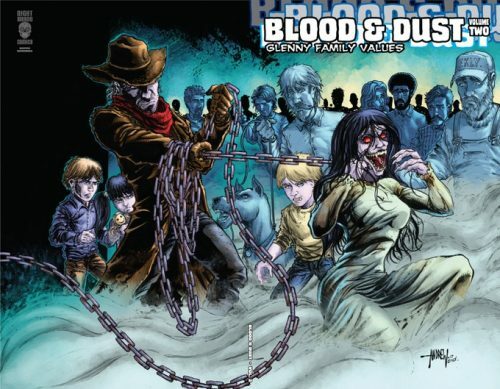 Glenny Family Values is the second volume of the Blood & Dust saga that began with volume 1, The Life & Undeath of Judd Glenny and is an 80-page graphic novel continuing the story of Judd Glenny and his vampire family. Ride along with Eddie Jacobs and listen to Judd tell the tale of how the Glenny Family came to be and the hellish night Judd died and was reborn. All while racing to stop Ruth from killing…everyone. 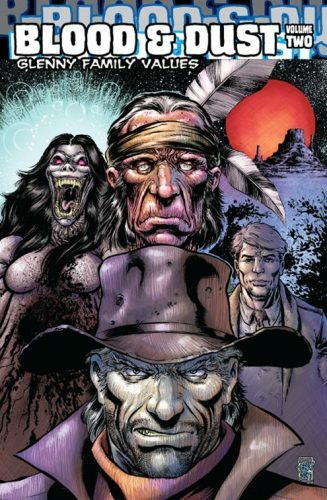 The imagery previewed on the Kickstarter page both have that gritty feel of a western along with the pure blood and gore as viscera really drips off the page (off the fangs?). That inspires me, chills me, and mostly causes me to root for Michael (and his team) that this Kickstarter is successful and that he manages to get one more step closer to his goals. While this one is for Volume 2, if you missed out on Volume 1 there are Reward levels for you with both physical copies only $25. Starting at $25 you have a Kickstarter Exclusive Wraparound cover. 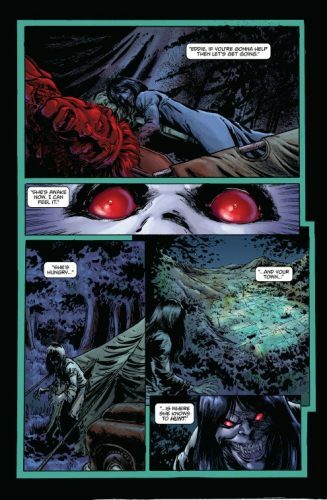 For those who want original pages, those start at $150, and if you are feeling really dark and gruesome this Halloween season, you might want to check out the Double page slaughter ($300) which is a double-page spread of the original pencils. As they put it “something you have to see for yourself”. I haven’t read the first volume of the series, but that’s almost all I need to jump in and start reading. I mean, if ever you were going to jump into a comic like this – October feels like the right time. For more information on Blood & Dust Volume 2, check out their Facebook page here. Tagged Blood and Guts, Steampunk Fridays.